Lately I’ve been feeling disenchanted with the world. About the only thing I find enchanting is my lovely, colorful garden. This is just a phase I’m going through. We all have them. To console myself, instead of watching evening tv, I crawled into bed with food. Figuratively, not literally! I perused my cookbook shelves and started pulling notebooks and recipe books that spoke to me. I have a few treasured and tattered notebooks that contain my private collection of dessert recipes from my days as a pastry chef . I’ve relied on the basics from these books but really haven’t delved into the more serious desserts that lined my pastry cases. Suddenly, my enchantment with life was restored. Flashbacks of colorful fruit desserts filled my head and my creativity shifted into fifth gear. 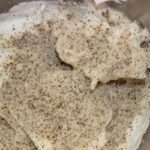 A recipe for almond meringue caught my eye. “How could I make this special and new?” I asked myself. Rhubarb! And it was all over. I quickly jotted down my ideas and slept well, excited to start cooking and already tasting the combination I dreamed up. 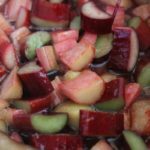 Rhubarb is one of those indescribable flavors that if you love it, you really love it and count the days until it is in season. 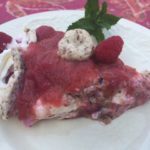 Rhubarb pie – who doesn’t love it? Every year I wait for spring rhubarb and try all sorts of new recipes using this vegetable. Yes, it is technically a vegetable. Rhubarb is just beginning to make its appearance in southern California. 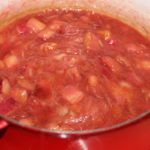 My friend Di lives in Iowa and told me last week how she and her sister planned to pick the rhubarb in their backyard that grows like crazy and make strawberry rhubarb jam. I was envious. I became so whinny about her stash of rhubarb, she even offered to ship me some! My vision for a cake with rhubarb turned out perfectly, in beauty and in bite. I assembled it yesterday afternoon, took photos and then my mom and I dug in, anxious to taste it, as our dinner cooked. “Dessert first?” We asked each other. We both nodded and could not put our forks down. And yes, we did have another piece each after dinner! As beautiful as it is, because it is a meringue, has a short shelf life and when cut, does not hold its shape for long. Use a serrated knife for best results. There are just two steps to the recipe and each can be made a day ahead. 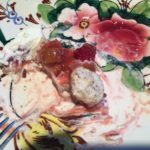 The rhubarb compote will last for 7-10 days in the frig and once the meringues are baked, you can leave them in the oven (oven turned off) overnight so they won’t collect moisture and will stay dry. This recipe is one of the very best, I think, I have ever created. I hope you make it and enjoy it as much! ¾ cup sugar, 150 grams, split in half. Line two sheet trays with parchment paper. Place an 8” cake pan bottom on the paper and draw a circle for your template. Repeat two more times. You will need three circles for the three layers of meringue. Turn the paper over so you can see the outline but the meringue will not absorb the ink or pencil! Measure half the sugar, the almond meal and cornstarch together. Set aside. Beat egg whites until foamy and starting to hold together. Slowly add the remaining half the sugar – 75 grams. Beat until glossy about 5 minutes total time. Fold in remaining sugar/almond mixture. 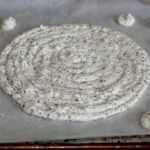 Place the meringue into a 14-16” pastry bag, fitted with a plain tip and starting on the outside line, pipe the meringue, working your way inward until the circle is all meringue. Repeat with the other two circles. I had a little bit of meringue left over so made these little buttons to use as added decorations. Bake 225 degrees for about one hour or until very dry. Turn the oven off and let your meringues sit there until you are ready to use them. Combine sugar and water in saucepan. Stir until sugar is dissolved. Add rhubarb and lemon juice. Cook on medium heat for about 10 minutes. The rhubarb will break down. This is the reason I cut it into such large pieces. Cool and refrigerate until ready to use. Whip cream until soft peaks form. Place whipped cream in a pastry bag, ready to pipe. Place one meringue round on a cake plate or cardboard cake round. Spread about 1 cup of the rhubarb compote evenly on top of the meringue. Pipe a whipped cream border around the edge of the cake, then fill in the middle. You can go lightly on the cream in the middle. The whipped cream adds a creaminess but you don’t want the cake to be mostly cream! Sprinkle on about ¾ of the box of raspberries. I made sure some of the raspberries stuck out of the sides for the glamour effect. Repeat with another meringue, rhubarb compote, cream and raspberries. 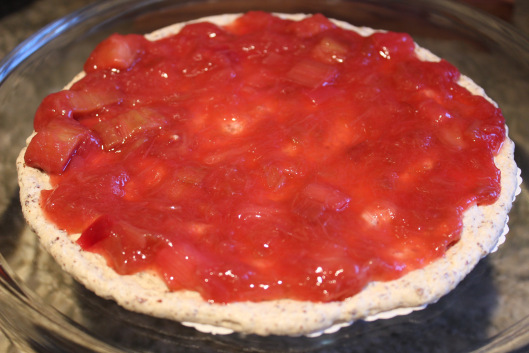 Place the last layer on top and spread with remaining rhubarb. 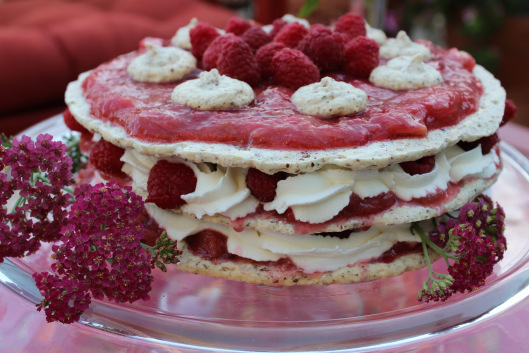 Sprinkle the remaining raspberries on top and voila! This would be delicious served with chilled Prosecco.